Road safety charity the Institute of Advanced Motoring (IAM) is offering weekly motoring tips from Britain’s top advanced driver, Peter Rodger. This week, he is advising on getting to the airport safely for your summer holiday. Check your vehicle thoroughly before the big day, including fluid levels, tyres, mirrors and windows – you’ll be on a tight schedule on the day, so the last thing you need is a breakdown. Your luggage should be packed into the boot of your vehicle. If you do need to put some belongings on the back seats, make sure they do not obstruct your view out of the rear window and secure them in place before setting off. Leave in plenty of time – if you feel rushed on your way to the airport then you are likely to make silly mistakes or even creep over the speed limit. Plan your route to the airport the day before and check travel reports for any disruption or road closures before you set off. Get plenty of sleep the night before you travel to ensure you’re alert from the very beginning of the journey. And if you have to travel a good distance to get to the airport, leave enough time to schedule in a rest stop to fight the onset of fatigue. Park carefully at the airport. Try to find an area which is not too crowded – the fewer cars around you, the less chance there is of someone clipping your vehicle with their luggage. The Good Garage Scheme would like to thank the IAM for this weeks contribution. 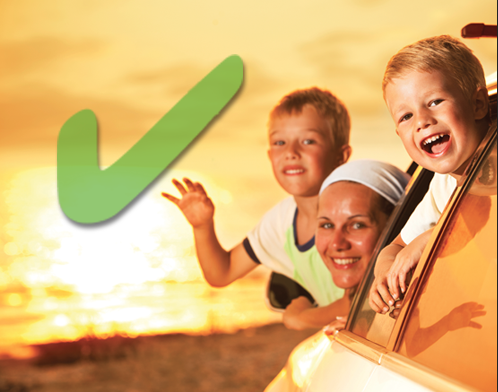 For peace of mind, why not take your vehicle to a Good Garage Scheme member garage for a final check before you set off on holiday and download the free app. Wherever you travel in the UK, you can easily find a garage you can trust.